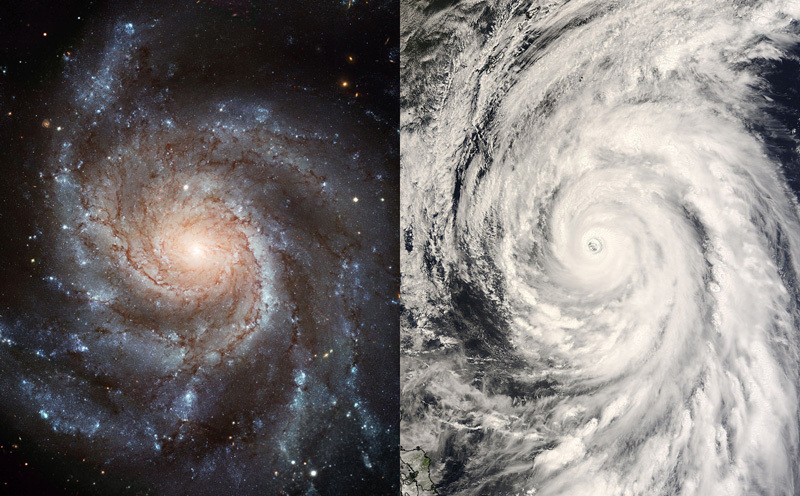 Explanation: Uncomfortably close Typhoon Rammasun (right) and 25 million light-year distant galaxy M101 don't seem to have much in common. For starters, Rammasun was only a thousand kilometres or so across while M101 (aka the Pinwheel Galaxy) spans about 170,000 light-years, making them vastly dissimilar in scale, not to mention the different physical environments that control their formation and development. But they do look amazingly alike: each with arms exhibiting the shape of a simple and beautiful mathematical curve known as a logarithmic spiral, a spiral whose separation grows in a geometric way with increasing distance from the centre. Also known as the equiangular spiral, growth spiral, and Bernoulli's spiral or spira mirabilis, this curve's rich properties have fascinated mathematicians since its discovery by 17th century philosopher Descartes. Intriguingly, this abstract shape is much more abundant in nature than suggested by the striking visual comparison above. For example, logarithmic spirals can also describe the tracks of subatomic particles in a bubble chamber, the arrangement of sunflower seeds and, of course, cauliflower.